competed against 121 other Grenache varieties and finished in the top five. On Friday the 7th of October, the results for the 2011 Royal Adelaide Wine Show were announced. The competition entries in the Royal Adelaide Wine Show are judged by a team of high profile Australian wine industry representatives. The 2011 clos Clare Watervale Riesling received a Silver Medal for the second consecutive year. On the 5th, 6th and 7th of October, the 2010 Royal Adelaide Wine Show was held in Adelaide. 2, 564 entries from 363 different Australian wineries were received and wines were judged in classes determined by variety and vintage(s). The 2010 clos Clare Watervale Riesling received the top silver in class 5 and was the 6th highest scoring 2010 Riesling out of 87 entries. This is a great result for us and reinforces the quality of our 2010 Watervale Riesling. 2010 Riesling receives Gold and Top 10 in Australia at Canberra International Riesling Challenge. On the 11th-13th of October, the 11th annual Canberra International Riesling Challenge was held in Canberra. This is most significant event of its kind in the southern hemisphere and included over 400 Rieslings from 10 countries around the world. Wines were judged in classes according to vintage and region and all gold medal wines were re-judged to determine the Worlds Best Riesling and top 10's from each participating country. 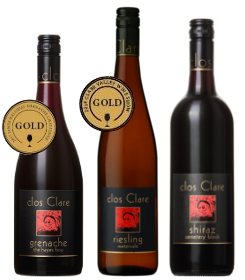 The 2010 clos Clare Watervale Riesling received a gold medal in class 1 and also made top 10 Australian Riesling.